Winning three gold medals in individual events at the Idaho State Track and Field Championships is something that doesn't happen every day. It happened Saturday for Camas County junior Katelyn Peterson and Richfield junior distance runner Sasha Kent. They earned three gold medals apiece during the State 1A portion of the United Dairymen of Idaho's 94th annual track meet at Boise's Bronco Stadium. Peterson finished up a sweep of the 1A jumps Saturday morning with a 17-1 long jump for first place by eight inches. On Friday she defended her title in the triple jump by over two inches in 36-0.75 and also set a new classification record in high jump with a 5-7 leap. In her final event, the 300-meter intermediate hurdles, Peterson was the early leader but was overtaken in the final 100m by Lapwai senior Katherine Samuels (47.40 seconds). Peterson (48.40) settled for second place to finish up her two days with an amazing 38 points. Peterson said, "I gave it all I had. It was hours and hours of work, and I'm glad it's over. I only started the long jump a few weeks ago and my winning jump popped out of nowhere. I had hoped to get 5-6 in the high jump and ended up with 5-7." Richfield's relentless distance runner Kent swept the 3200m (11:40.86) by nearly 30 seconds, 800m (2:20.42) by almost six seconds and the 1600m (5:25.19) by over 12 seconds. She earned 30 of Richfield's eighth-place 34 points, while Peterson piled up all of Camas County's sixth-place 38 points at state. The Carey Panthers claimed a pair of gold medals from their boys' 4x200m relay team of Lynn Mecham, Jack Cenarrusa, Jacy Baird and Joe Laidlaw (1:33.02), and from senior Laidlaw in the 300m intermediate hurdles over his rival from Murtaugh, Humberto Pacheco. Baird's dominant third leg in the relay gave Carey the edge it needed over second-place Greenleaf Friends (1:33.61). The winning Carey time was only one second off Oakley's two-year-old record. Later Saturday, Laidlaw was strong from start to finish in the hurdles. His time was 40.87 seconds, ahead of silver medalist Pacheco (41.06). It was a reverse of the finish of the state-qualifying district meet May 12 at Jerome when Pacheco edged runner-up Laidlaw 41.74-42.24. "We seem to take turns winning—and it was my turn," said Laidlaw about the friendly rivalry. "I've never been so nervous before a race than I was for the hurdles. I just told myself—it's my time, it's my time. The start was perfect for me, and I did well over the last two hurdles that always seem to give me a tough time." Saturday's finale of the three-day state track championships on a perfect spring day was also a time to shine for Community School sophomore sprinter Ellie Swanson, a four-event qualifier this year. Swanson placed third in the 1A 400m dash (1:02.28) and picked up six of the 12 Cutthroat points. And she anchored the 4x400m relay with Hayley Rheinschild, Katie Feldman and Maranda Stopol that finished fifth at 4:31.60. Cutthroat coach Andy Jones-Wilkins said, "Ellie had a rough first day and was frustrated with her preliminary time in the 400m Friday. But on Saturday she focused and did an outstanding job in the final. The relay had a quality race, cutting 22 seconds off its time." The Mackay Miners won their first girls' state track title 53-44 over Challis, Troy and Liberty Charter, while Challis won its first boys' championship 114-64 over defending champion Idaho City. The Carey boys (28) placed seventh. 3rds—Micaela Adamson (Carey) triple jump 33-5; Carey girls' medley (1:59.36); Bryan John (Camas) 1600m in 4:46.77; and Camas County boys' 4x400m (3:35.91). 4ths—Bryan John (Camas) 3200m in 10:24.76; Carlos Robles (Camas) 40-11.75; and Carey girls' 4x200 (1:53.50). 5ths—Joe Laidlaw (Carey) 100m in 11.65; and Carey boys' 4x400 (3:39.43). 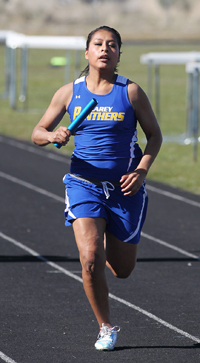 6ths—Jaide Parke (Carey) 3200m in 12:34.50; and Carey girls' 4x100m (54.31). 7ths—Maranda Stopol (TCS) 800m 2:34.99; and Jaide Parke (Carey) in 5:56.44. Wood River High School junior Cheyenne Swanson has been there before, and that experience as a state champion paid off Thursday during the United Dairymen of Idaho's 94th annual State Track and Field Championships in Boise. Swanson needed one good throw and she got it with a 115-9 effort that gave the six-foot-tall field performer her second consecutive State 4A girls' discus title. She threw 14 inches farther than the top-seeded athlete, Columbia senior and discus runner-up Nikkole Conlon. Although Swanson came in as the defending champion, she had only the 11th-best state qualifying throw out of 17 competitors, at 101-10. That was her throw when Swanson finished a distant second to Minico junior Linsey Bair (111-5) at the Great Basin Conference meet. Not only that, Swanson scratched in several other throws at state. But she came up big with the winning 115-9 toss and gave Wood River's girls their only points, 10 for her gold, at the two-day meet staged at Bronco Stadium. GBC queen Bair (110-01) was third. Swanson's winning throw last year was very close, 115-11. While Swanson's big throw was the Hailey highlight, senior distance runner James Paris provided two highlights of his own. Paris came up big with two of his best runs around the Lyle Smith Field oval in 3200-meter and 1600m finals Thursday and Friday. Paris shaved 30 seconds off his state-qualifying time with a second-place 9:41.56 finish behind Hillcrest senior Tyler Crofts (9:27.93) in Thursday's 3200m final. Crofts was the record-setting defending champ, and Paris entered Thursday's two-miler with the 10th-best qualifying time, but Paris out-raced fourth-place GBC king Erik Harris of Twin Falls (9:54.03) by over 12 seconds. Harris, a junior, and Paris waged a memorable battle in the 1600m final Friday night. Harris was the top seed, and Paris had the fourth-best time, but they were side-by-side at the start of the bell lap. Paris pulled ahead at the 300m mark but Harris saved a final burst. The gold went to Harris in 4:21.24, less than two seconds behind the 2010 top time of Wood River's Chase Caulkins. Paris earned his second silver medal with a 4:22.76 finish, seven seconds faster than his qualifying time and 11 seconds off the 4A record. Crofts settled for third place in 4:26.11. Wood River's sprint medley team took seventh place in 3:46.05 and sophomore sprinter Ian Keys was eighth in the 100m dash finals in 11.38 seconds. The Wolverine boys were 15th out of 24 schools with 19 points for the State 4A meet. Rigby won its second consecutive State 4A boys' team title 87.5 to 61.5 over Emmett. The Jerome girls collected their first 4A title since 2002 and ninth overall 96-81 over defending champ Bishop Kelly of Boise. Senior 1600m champion Mackenzie Chojnacky piled up 24 of those 96 points. 5A: Mountain View's girls on their first title 127-76 over Coeur d'Alene, and the Rocky Mountain boys earned their first title 101-87 over defending champion Eagle. 3A: The Timberlake girls captured their first title 92-79 over Buhl, and the Buhl boys brought home their first state track title since 1978 by a 108-102.5 margin over defending champion Payette Pirates. 2A: Nampa Christian's girls amassed their 13th state title, and record-setting seventh straight, by a 127-85 edge over Gooding. The West Side boys snuck away with their second straight championship 88-87 over Cole Valley Christian.